The twin city of Ayodhya and Faizabad had determined national politics for almost two decades. For the people living here building the Ram Mandir is not the issue. They want the development of this holy city so that tourists return, thereby generating employment. 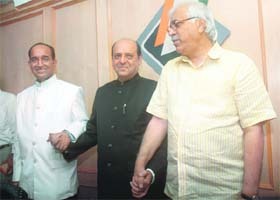 Navin Chawla took over as the new Chief Election Commissioner succeeding N Gopalaswami, who relinquished charge yesterday. Chawla, 64, who was the senior-most election commissioner after Gopalaswami in the three-member panel, will remain in office till June 29 next year when he turns 65. The Rajya Sabha has agreed to provide asset details of the union ministers, who are members of the house, to an RTI applicant. Replying to an RTI query from activist Subhash Chandra Agrawal, the Rajya Sabha secretariat said details about assets and liabilities of 16 out of 18 union ministers belonging to Rajya Sabha were available with it. Barely three days after he had put the Congress in a fix by putting the onus of Babri Mosque demolition on it, Railway Minister Lalu Prasad Yadav fired another salvo at the Congress today by saying that the UPA would select its Prime Minister after the polls. The first ancient republic to have introduced democracy in this part of the world, Vaishali, is to witness a keen contest in the next couple of days between Union Minister for Rural Development and RJD candidate Dr Raghuvansh Prasad Singh and a don-turned JD(U) MLA Munna Shukla, a NDA candidate. In the Kendrapada Lok Sabha segment of north east Orissa, the fight really is between two Page 3 men. For the BJD, the man in the fray is Bayjant Panda, known better in Delhi’s party circuit as Jay Panda, who wedded Cadbury’s famous jiving model Jagimangat. Here it is ‘kamal’ versus Kamal. Chhindwara is the fort of Union Commerce Minister Kamal Nath who has been winning from this constituency since 1980. He lost only once in the 1997 bypoll to former BJP Chief Minister Sunderlal Patwa. The BJP today charged the UPA government with mismanaging the economic affairs of the country during its five-year rule and said the ‘aam admi’ was the worst victim of the exorbitant price rise, which has emerged as a major issue in the Lok Sabha elections. Former Chief Election Commissioner N Gopalaswami today said there is a growing criminalisation of politics and favoured barring of persons with heinous criminal charges against them from contesting polls. He also said he had no intentions of joining politics. The footwear-chucking infection seems to be spreading. Bollywood actor Jeetendra was the latest target of a slipper thrown at him during a Congress party road show in a Maharashtra town today. Congress star campaigner Priyanka Gandhi today said India as a nation cannot forgive LTTE chief V Prabhakaran for the assassination of Rajiv Gandhi though personally she and her family harbours no "hatred or anger" against killers of her father. The Supreme Court today said it would "intervene" wherever necessary to ensure that fast track courts (FTCs) conduct a "fair trial" in cases relating to the 2002 Gujarat riots. Seven policemen were killed in two separate incidents of violence as militants belonging to the outlawed Dima Halam Daoga - DHD(J) or Black Widow - renewed violence in the North Cachar Hills district in Assam yesterday. Bringing in this whiff of hope by firmly putting behind the bitterness of the mandir-masjid movement is the Raja of Ayodhya, Vimlendra Mohan Mishra, or Pappu bhaiya as he prefers to be called. After remaining non-partisan throughout the more than two-decade Ayodhya trouble, he finally entered politics early this year to restore the lost prestige of Ayodhya. “Outsiders had turned Ayodhya into a battlefield. All parties took political advantage and reduced us to second-class citizens. We now want basic amenities like drinking water, roads and better infrastructure so that tourists return and citizens can start earning their livelihood”. He is the BSP Lok Sabha candidate from Faizabad and has virtually set the agenda for the electoral battle with the other parties trying their best to measure up. “My condition before joining hands with the ruling party was the development of Ayodhya and Faizabad. The peace-loving people here have suffered a lot. Outsiders grabbed power at New Delhi and elsewhere on the basis of our sufferings.” Early this year the Mayawati government had announced a Rs 234-crore package for the twin city of Ayodhya-Faizabad to improve the infrastructure and renovate temples and historical sites in the area. More than three dozen projects are to be executed and on the anvil are plans to build a Rs 50-crore Buddha Vihar, an Rs 22.9-crore international Ramlila Centre, a Shilpgram and a Tulsi auditorium in Ayodhya. This promise of turning Ayodhya into a well-equipped tourist destination has virtually taken the wind out of the temple issue. “Had the Ram temple still been an influential issue senior BJP leader Vinay Katiyar would not have dropped this seat in favour of Ambedkar Nagar,” says Munna a first-time voter who runs a shop selling religious cassettes near the Hanumangarhi. At the height of the Ram temple movement in 1991, BJP had won this seat and repeated the feat in 1996 and 1999. These three victories were primarily due to its candidate Vinay Katiyar, who as Bajrang Dal chief was allegedly involved in the demolition of the Babri mosque on December 6, 1992. This time, the sitting BJP MLA from Ayodhya, Lallu Singh is the BJP candidate. A stalwart from the mandir movement he has represented the seat in the Vidhan Sabha on five occasions. Significantly, while addressing his election rally near Ayodhya on April 12, the BJP leader Narendra Modi left many stunned when he focused on the theme of development and altogether passed over the issue of a grand Ram temple. Giving the development mantra, Modi urged people to focus their energies in that direction as it alone could change the destiny of this country. “You must rise against the politics of caste and the vote politics of appeasement. This is the time for propagating the politics of development,” said the BJP leader to the cadres not quite accustomed to this discourse. After delimitation the demographic profile of the constituency has also changed, taking away a large number of upper-caste votes and bringing in a sizable number of Muslim voters because the Rudauli assembly segment from neighbouring Barabanki has been added into Faizabad. Mitrasen Yadav, the sitting BSP MP from Faizabad, is the SP nominee this time. After he and his son, a minister in the Mayawati government, got embroiled in several criminal cases, including that of murder; he was denied the BSP ticket. He walked over to the SP. With a hold on the rural segments of the constituency, Yadav too believes that Ram Temple is no longer the determining issue. He had won the Faizbad seat on a CPI ticket of in 1989, SP in 1998 and BSP in 2004. However, this time he faces an uphill task, as he does not enjoy the support of the SP cadres and workers who are angry at his changing stance. The Congress candidate Nirmal Khatri who won the seat in 1984 during the Rajiv Gandhi era is now again in the fray with the development plank as an election issue. He predicts development will play a significant role in determining the outcome. He will over see four phases of the polls. Today he called upon youth and rural voters to come out to vote to strengthen the democracy. Within hours of assuming charge, Chawla faced flak from the BJP. “We have already seen the Chawla effect on the ongoing Lok Sabha polls,” BJP spokesmen Yashwant Sinha and Rajiv Pratap Rudy told reporters here while claiming that no police personnel were present at many booths when polling was on in the first phase in their respective parliamentary constituencies of Hazaribagh and Saran. In the past, the BJP leadership has made no bones about its opposition to Chawla, claiming that he was biased in favour of the Congress party. Both Sinha and Rudy claimed that they had complained to the EC about the non-deployment of security personnel in their constituencies and sought repoll in certain booths. Even five days after polling, the commission had not communicated to them its decision on repoll. Their comments came a day after another senior BJP leader Arun Jaitley stated that his party would consider what future course of legal action was available to it after the government rejected his plea seeking details under the RTI of the recommendation made by Chawla’s predecessor N Gopalaswami seeking the latter’s removal as election commissioner. The Rajya Sabha has agreed to provide asset details of the union ministers, who are members of the house, to an RTI applicant. Replying to an RTI query from activist Subhash Chandra Agrawal, the Rajya Sabha secretariat said details about assets and liabilities of 16 out of 18 union ministers belonging to Rajya Sabha were available with it. It also asked Agrawal to deposit requisite fee for the papers. Agrawal wanted information on assets, wealth and income of all the ministers in the UPA government and their spouse. But the matter kept scuttling between the PMO and Cabinet Secretariat as who held the requisite information. In December last, the PMO informed Agrawal that details could not be given as the information was exempted from disclosure. During the hearing of the plea, CIC referred the matter to the speakers of Lok Sabha and Rajya Sabha, saying "such information is not disclosable except with the permission of the Speaker". After the decision, Agrawal filed fresh RTI applications to both the houses in the same matter. "You had sought information regarding assets and wealth of ministers in the Union Council of Ministers, including their spouse and dependent children. The information is now available," the Secretariat responded. Earlier, the Central Information Commission while referring the matter to the Rajya Sabha and Lok Sabha held, "The matter will be referred to Somnath Chatterjee, Speaker of the Lok Sabha, for disclosure of such information as relates to those Members of the Council of Ministers who are Members of the Lok Sabha." Regarding the ministers belonging to Rajya Sabha, the CIC said if there was a similar rule for the House, the same could also be exercised or else the matter be referred to the third parties (ministers in this case) to seek nod for disclosing the assets. "If there is any equivalent rule with regard to the Rajya Sabha, this may also be exercised, although, we were not told of existence of any such rules during the hearing," it said. In reply to a question whether he had some objections on Manmohan Singh’s candidature as the next PM, Lalu quipped ‘Manmohan Singh is a good man’. Notably, both Lalu and Paswan were repeatedly swearing their wholehearted support to the UPA form its government under the leadership of Dr Manmohan Singh after they had parted with the Congress over seat-sharing in Bihar for the ongoing Lok Sabha polls. Even while putting a united show with Mulayam Singh Yadav at Lucknow at the beginning of this month, the duo talked about being a part and parcel of the UPA and also announced Manmohan Singh’s name as the next Prime Minister. Both Singh and Shukla have locked their horns in a straight fight. However, the Congress candidate, Hind Keshri Yadav, a former minister of Bihar in Lalu Prasad government, is working hard to make it a triangular contest. Shukla, as an Independent, had polled 2.5 lakh votes against Singh, the RJD nominee during last Lok Sabha polls. In view of his popularity, the JD(U) made him its nominee first in the Assembly election and now in this Lok Sabha polls. Apart from enjoying a massive support from his caste voters, Bhumihars, Shukla is banking upon the vote bank of NDA for his victory. On the other side, the Rajputs, from which caste the union minister hails, are solidly behind him. But the traditional vote bank of RJD, Muslims and Yadavs, are no more intact. There may be many other reasons for the Muslims to drift away from Lalu and prefer to vote for the Congress, but the immediate provocation seems to be the election for Siwan seat. The Yadavs in Siwan strongly opposed the official RJD nominee, Hina Shahab, wife of incarcerated MP Mohd Shahabuddin and voted en masse for Om Prakash Yadav, an Independent. Lalu Yadav who claims to be an unchallenged leader of his caste in Bihar could not do anything to make his castemen vote for his party in Siwan. Since then, the Muslims in north Bihar are said to have become somewhat disenchanted with the RJD. In Vaishali also, a majority of Muslims are openly supporting the Congress. What seems to have added further to the woes of Raghuvansh Prasad Singh is that he is from the Rajput caste, who had strongly voted against Lalu Yadav in the adjoining constituency of Saran. When the Rajputs in Saran preferred their caste man Rajiv Pratap Rudy (BJP) against Lalu Yadav then why should they expect the Yadavs to vote for their caste man in Vaishali, rued Balram Yadav of Minapur. There were many other indications suggesting a split in M-Y combination of RJD, which is bound to affect the poll prospects of its candidates not only in Vaishali but many other constituencies going to the polls in north Bihar on April 23. In the Kendrapada Lok Sabha segment of north east Orissa, the fight really is between two Page 3 men. For the BJD, the man in the fray is Bayjant Panda, known better in Delhi’s party circuit as Jay Panda, who wedded Cadbury’s famous jiving model Jagimangat. The latter had surprised everyone by dancing around the cricket field in a delicately crafted advertisement that captured the national imagination a decade ago. That day and this, Panda and his model wife have gone on to do a lot of innovation in their home state of Orissa, where they now own Oriya TV, the most-watched private television channel with an obvious pro-Naveen Patnaik stance. The Orissa CM’s fondness for Panda (who engineered the NCP-BJD deal in Orissa) is also clear from the way he first nominated the industrialist to the Rajya Sabha and is now fielding him from a Lok Sabha segment considered the safest BJD seat in the state. It’s a constituency Naveen’s father and BJD founder Biju (Bijaynand) Patnaik represented thrice in a row from 1977 to 1984. Also the strongest anti-Congress bastion for 30 years, Kendrapada this time is in sharp focus for the sheer glamour attached to its contestants. While Jay Panda - being the third richest MP candidate in the state with assets worth over Rs 17 crore; the chairman, IMPHA group; and son of Orissa’s wealthiest industrialist Bansidhar Panda -- enjoys a name in the area, his Congress rival Ranjib Biswal is equally popular, thanks to the latter’s cricketing roots. Biswal, son of Orissa’s former deputy CM Basant Kumar Biswal, is member of the BCCI and selector, east zone, for the coveted Indian cricket team. That explains the huge Biswal following among the youth, who dream about their date with destiny some day. Besides, both Panda and Biswal are reputed media barons of Orissa; the latter owns Samay, one of the two local pro-Congress Oriya newspapers. It would be interesting to see which way the tide turns in this seat, whose sitting MP Archana Nayak, formerly with the BJD, is now the BJP candidate from Bhubaneshwar LS segment. The rebel factor naturally will play a key role in Kendrapada, likely to witness the disintegration of anti-Congress votes in this election. Where on the one hand Nayak’s supporters are unhappy with the BJD’s decision of fielding Panda from the seat, on the other, another mighty rebel Bijay Mahapatra is doing the damage. One of the founders of the BJD and a confidante of Biju Patnaik, Mahapatra was turned out of the party by Naveen. He is now the BJP candidate from Patkura assembly seat, and is seen as a major deterrent to BJD’s smooth ride in this LS constituency. Jay Panda, for his part, is banking on BJD’s old clout in the area, while Biswal is concentrating majorly on the Bangis (Bengalis settled in this coastal belt), who can tilt the balance in anyone’s favour. They number around four lakh and are yet to recover from the affects of 1999 super cyclone, which devastated Kendrapada the most. Seventy per cent of the 50,000 casualties in Orissa at that time were from this area. The BJP’s dream is to break Kamal Nath’s monopoly in Chhindwara which goes to Parliamentary polls on April 23. The state Chief Minister Shivraj Singh Chouhan, on his part, is pulling all strings and has already visited the segment thrice for campaigning for the party. Seeing the stature and record of Kamal Nath, the BJP, on Chouhan’s request, has fielded Parduna’s strong sitting MLA Marutirao Khavse against the former. 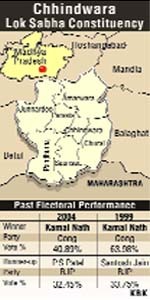 In the past, despite winning in a good number of assembly segments of this constituency, the BJP failed to unseat Kamal Nath. In the November 2008 Asembly polls, the saffron party won four out of seven seats. While the BJP secured victory in Parduna, Amarwada, Parasaia and Sounser, the Congress captured Chhindwara town and tribal seats Junnardev and Chorai. Marutirao Khavse belongs to the Pawar community, which has a stronghold in the Parduna and Sounser areas. On the face of it, Kamal Nath appears confident. Pointing a finger towards him, he says in a lighter vein, “The BJP is also working for Kamal’s victory. (The lotus flower - ‘kamal’ - is the election symbol of the saffron party).” But the reality is that he may be feeling the heat, especially with the candidature of Khavse. That’s why, he recently called Bollywood’s popular actor Salman Khan to campaign for him. The Union Minister is again banking on the tribal and Koyalanchal areas to ensure his victory. Only time will tell which ‘kamal’ will bloom this time. The ‘dream team’ of Prime Minister Manmohan Singh, former Finance Minister and now Home Minister P Chidambaram and Planning Commission Deputy Chairman Montek Singh Ahluwalia was primarily responsible for the current economic ‘mess’, BJP spokesman Yashwant Sinha told reporters here. These were exactly the people who caused the economic crisis in 1991 and 1997-98 as well. He drew attention to the latest report of the RBI on the economy which quoted annual figures of price rise between March 2008 and March 2009 of some essential items, which proved beyond doubt how the prices of mass consumption items like food grains, sugar and edible oils had sky rocketed. The situation had only gotten worse since March this year. Sinha claimed that the UPA had inherited an economy which was in the pink of health from the NDA regime in May 2004 but was leaving behind an economy which was in a ‘total mess’ in which growth had slowed down considerably, demand decelerated, government’s budgetary deficit crossed all prudential limits and employment opportunities declined. In an interaction with women journalists here, Gopalaswami, who demitted office yesterday, said he accepted the fact that politically motivated cases could be brought against any person contesting the polls and therefore any case registered six months prior to elections should not be considered. The former CEC ruled out joining politics, saying he has no plans of entering Parliament, and favoured barring of retired CECs from joining politics for the next 10 years. Jeetendra was addressing a road show organised by the Congress candidate Manikrao Gavit in the town of Nandurbar, around 375 km from here, when someone from the crowd chucked a slipper at him. “There were over 3,000 people in the road show at Jalata Bazaar. Somebody from the crowd threw a slipper in the actor’s direction,” said Inspector BM Pawar, adding that the incident took place at 1.45 in the afternoon. Party activists immediately pounced on the offender - identified as Dilip Ingle - and took him away. The motive behind his slipper chucking was not clear. An official from Nandurbar police station said no complaint had been registered with them. The police said they had deployed adequate security in the area, which goes to the polls on Thursday. Priyanka also downplayed the controversial comments of DMK chief M Karunanidhi that Prabhakaran is not a terrorist, saying she would have no "personal grief" even if anybody "praises" the LTTE chief. "This issue is both political and personal for me. I fully understand politically the former Prime Minister of India was assassinated and they (LTTE) cannot be pardoned by India as a nation," she said when asked what treatment she would like to be meted out to Prabhakaran if he is handed over to India by Sri Lanka. She, however, hastened to add: "From humanity point of view, I have nothing against them (killers) in my heart...neither anger nor hatred." Rajiv Gandhi was assassinated by LTTE in a suicide bomb attack in Tamil Nadu on May 21, 1991. Priyanka, in interviews to the media here while campaigning for brother Rahul Gandhi, referred to her meeting with Nalini, one of the convicts in Rajiv Gandhi assassination case, and described it as a learning experience. Asked whether she has forgiven Nalini, Priyanka responded, "I am like Nalini. I am a human being. One human being cannot forgive another human being." On Karunanidhi's comment that Prabhakaran is not a terrorist and the LTTE chief was his good friend, Priyanka said, "If somebody says things about them (LTTE) or praises them, it does not cause us personal grief. Politics is quite separate to us from our personal grief," At the same time, she noted that "he (Karunanidhi) has retracted his statement." She also declined to comment on AIADMK chief J Jayalalithaa's remark that Sonia Gandhi should tell the nation what she feels about the DMK chief's remark. "These are political things. I won't like to comment on that," Priyanka said. A three-Judge Bench headed by Justice Arijit Pasayat said the special investigation team (SIT) that was monitoring the probe would also keep a watch on the trial and submit quarterly reports to the apex court. The Bench, which also included Justices P Sathasivam and Aftab Alam, made the assurance on the suggestions made by senior counsel Harish Salve, assisting the court as amicus curiae, and the apprehensions raised by the National Human Rights Commission (NHRC) and some of the NGOs. Senior counsel Indira Jaisingh, appearing for some of the NGOs that are helping the victims and the witnesses, said it was possible that the supporters of the accused would enter the FTCs and threaten the witnesses. The Bench expressed the hope that the FTCs, with the help of the public prosecutors concerned and the SIT, would be able to ensure a fair trial. In case, it was still not possible, "we are here," the Judges clarified. The SIT, headed by former CBI Director RK Raghavan, had submitted its status report to the court in a sealed cover last week. Copies of the report were given to Salve and senior counsel Mukul Rohtagi, who represents the Gujarat government. The contents of the report were, however, carried by some newspapers in Gujarat. When Indira Jaisingh wanted to know how the report found its way to the media, the Bench said copies were given to the amicus and the state counsel in good faith and "whoever leaked it to the press had betrayed our trust. This is deplorable". While the court accepted a proposal for giving protection to the victims and witnesses and their families, it said another suggestion for giving a "subsistence allowance" to them was not possible as it would give rise to the allegation that they had been bought. The Bench said the Gujarat High Court Chief Justice would appoint the PPs in consultation with the SIT chief. The SIT would suggest replacement of PPs or appointment of additional PPs wherever necessary. Salve said the SIT had suggested the setting up of six FTCs to conduct the trial on a daily basis in the nine highly sensitive cases. The courts would be set up in five districts, including Ahmedabad, Mehsana, Saabarkantha and Anand. The trial in the Godhra train fire case would be held at Sabarmati Jail, Ahmedabad. Six policmen were killed when the DHD(J) militants ambushed police vehicle that was escorting a convoy of 16 trucks at Panmur under Diyungmukh police station in the hill district this afternoon. The trucks were on their way from Lanka in Nagaon district to Umrangshu to bring cement from a factory of Vinay Cements Ltd there.